Image: Proposed Chinese Reactor Design. Summary: The economics of Hinkley Point C project are so poor that it is believed to be essentially a loss-leader for China. What it does offer is a near-guarantee that China would have the right to build the next reactor at Bradwell in Essex and possibly another at Sizewell, using its new reactor design as a showcase for the world. 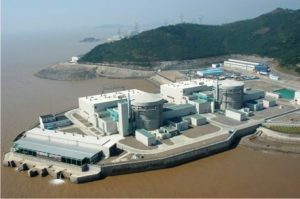 These reactors would be designed, built and operated by the Chinese Nuclear Power Corporation, a company intimately linked to the Chinese civilian and military nuclear programs. We have no insight into the motives the Chinese might have for building a reactor at Bradwell. The Chinese owners would sell electricity to the UK but we would have little idea of what other ambitions they might have. There is a great deal of international concern about Chinese expansionism in the South China Sea where substantial military bases are being constructed on tiny islands. The Chinese are completely ignoring the ruling of an international tribunal in the Hague that they do not have the right to do this. Were the Chinese to expand their activities at Bradwell we would have little way of knowing what they were doing or why they were doing it. Basically it all boils down to whether we can trust the Chinese to do what they say they will do and nothing more. The Chinese are widely believed to have a substantial cyber warfare operation within China which frequently targets Western including British facilities, military, commercial and research laboratories. There is a continual battle waged by GCHQ and MI5 to contain repeated cyber attacks. An unsupervised base for Chinese activity on UK soil would be extremely difficult to contain. If we discovered they were actually operating a covert facility there would be very little that we could do to stop them even assuming we had the military and technological capacity to do what we wanted. It is interesting to note that the US have completely embargoed any comparable activity by the Chinese on the US mainland for such security reasons. In addition, US authorities have recently arrested a senior Chinese Nuclear Group (CNG) executive on charges of spying within the US. In the post-Brexit world we need to develop commercial links with a wide range of countries. Would we accept Russia as a partner in such a project? I really don’t think so, with Vladimir Putin’s Russia also in an expansionist mood. Surely this means we must graciously decline Chinese involvement in Hinkley Point C.